I don’t think I could have written these words even two months ago because I was still unreconciled to my move to Santa Barbara. This is NOT my home, I would have told you. And then I would begin my rant. Where are the robins to sing up the dawn? 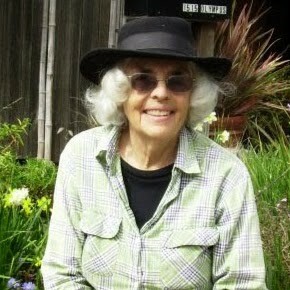 Where are the chickadees chattering in the oaks, or the Great-horned Owls hooting at dusk from the eucalyptus? Nothing was right. 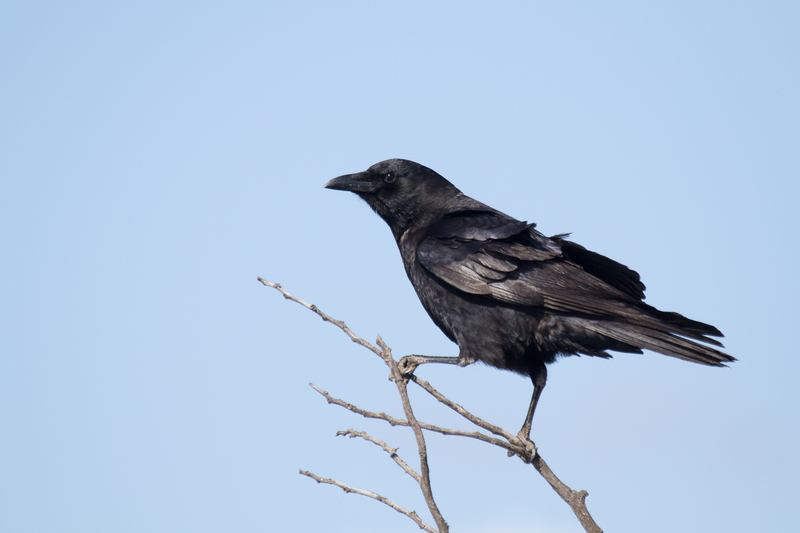 Here, it is a cacophony of crows – an unholy chorus – from dawn to dusk. The creek next to this retirement “campus” is dry as a bone, lacking the lush streamside vegetation to attract the spring singers like the Swainson’s Thrushes, Warbling Vireos, and Wilson’s Warblers that populated my beloved Strawberry Canyon. Some days, I would imagine sitting on the bench under the sheltering branches of the oak I had planted 60 years ago. Or I would envision myself at the U.C. Botanical Garden, climbing the path up to the Old Roses garden, and to the fence line where I could look up the steep chaparral-covered slope to the bent tree at the top of the hill. Coming down, I would stop to view the Bay in the “V” of the hills. Of course, there would be robins singing everywhere, and the Olive-sided Flycatcher calling from its perch at the top of a redwood. There’s no cure for this nostalgia other than to acknowledge that I will always look at what’s around me through Berkeley eyes. I don’t want to surrender that perspective. But maybe I could allow myself to consider the virtues of the South Coast, of Santa Barbara where everyone wants to come and visit and — if they could afford to – stay. A month after I came to live here last September, flocks of Yellow-rumped Warblers arrived, just like the ones in Berkeley. The manicured gardens of lawns, palms, and agapanthus beds were just fine with them. They dove into the palms and out again, forever “chipping.” Then a Hermit Thrush took up winter residency beneath the live oaks below my bedroom window. 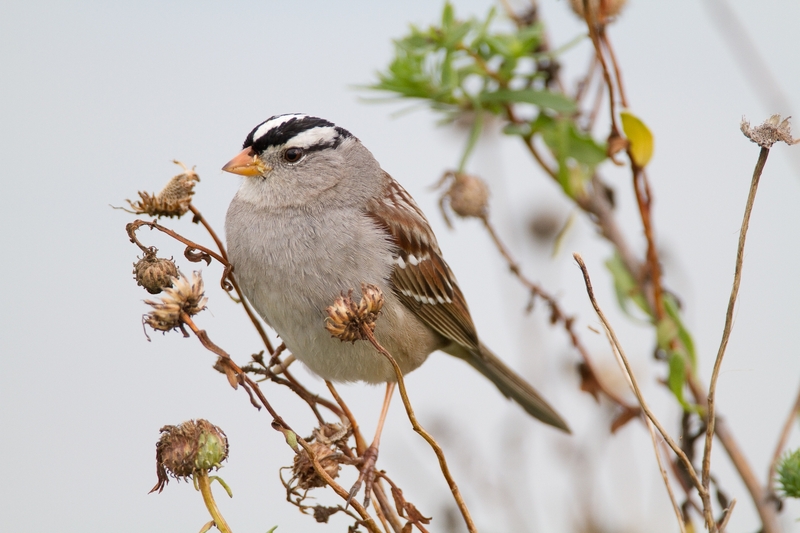 And then a troupe of cheerful White-crowned Sparrows arrived, singing sweetly, but in a different dialect. My retirement community is just up the hill from Oak Park, one of the scruffier city parks but with some fine live oaks and sycamores. Sycamores are new to me except for the ones I would infrequently see out around Sunol where they favored the flats near streams. They are the true eccentrics in the plant world – no two trees alike. Gravity often has its way with them, pulling long branches in deep curves that almost reach the ground, while other limbs look to the sky and grow upward in search of the sun. 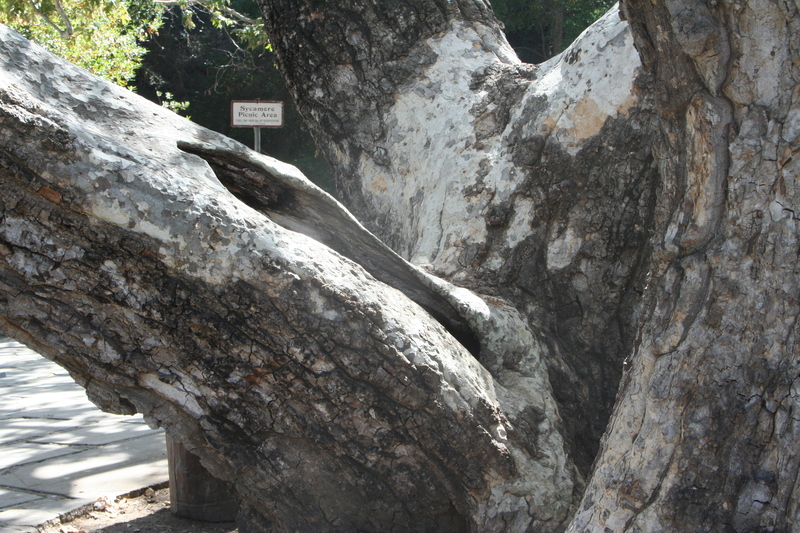 The trunks near the ground are often covered with thick, brown bark that gives way to thin plates of bark that continually shed, revealing patches of pale brown, gray, olive, and bright russet in newly exposed areas. I am always reminded of a pinto pony. The upper limbs — rising high above the companion somber live oaks — are almost pure white, especially stunning against a blue sky. Sycamores are attractive to birds partly for the opportunities they provide the cavity nesters. The larger holes invite woodpeckers and owls, with the smaller holes attracting House Wrens, nuthatches, bluebirds, and many others. Certain species of hummingbirds gather the down under the leaves to line their nest, while those winged beauties, the tiger swallow butterflies, leave behind eggs that become the voracious caterpillars that find the big palmate leaves to their liking. Mission Creek, considered the only perennial stream in the area, borders the park. But this part of the creek, a mile or so from where it enters the ocean, is always dry this time of the year. Only once during this record dry winter did a good rain fill Mission Creek with a wild white-and-tan froth of racing water. From its bank, I could hear the torrent rearranging rocks in the creek bed. The next day, the flow had slowed to a few reflective pools connected by a trickle of running water. One day later, the water had disappeared – gone! And it’s been dry ever since. I walk down the hill to the park most days, crossing a bridge where I often stop to examine the placard describing how the creek bed has been restored by removing tons of concrete that had acted as a barrier to the passage of the endangered Southern Steelhead Trout. In better times, the fish might have entered the creek from the ocean during winter storms, ascending the creek to spawn in the upper watershed where water remains year round. But not this year. Even the upper watershed in the Botanic Garden has been reduced to a few stagnating pools, with only the thinnest trickle of water in certain places. Sometimes I drive up into the foothills to visit the Botanic Garden, which like the one in Tilden Park is devoted exclusively to plants native to California. The upper part of canyon has its share of live oaks, small bays, and towering sycamores, but none of the dense riparian vegetation to attract the streamside breeders that fill Strawberry Canyon with their joyous songs. 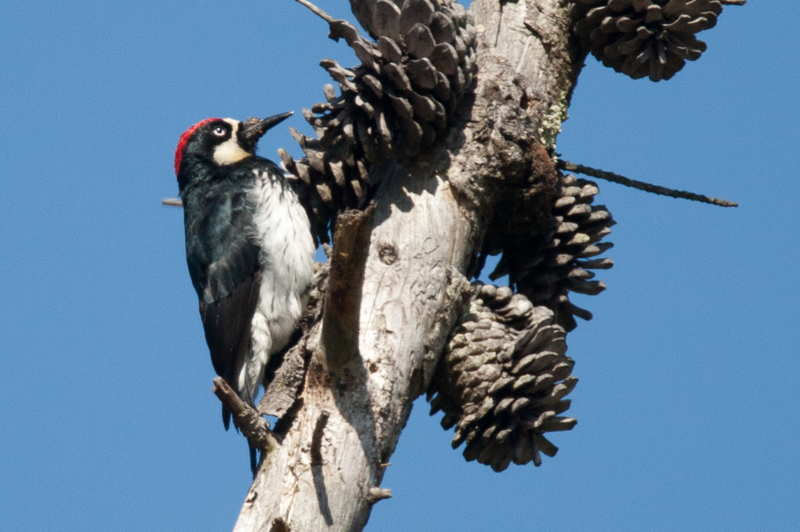 Many of the birds in the south coast canyons are the ones you might expect to see inland in the Bay Area – Acorn Woodpeckers, White-breasted Nuthatch (instead of Red-breasted), Phainopeplas, sometimes Canyon Wrens, and Wood Pewees. Stellar’s Jays are seldom seen in the lower elevations. Swainson’s Thrushes pass through in migration, only breeding in the rare streamside where the vegetation conceals this shy bird that mostly reveals its presence through its song. Today I visited such a place – Atascadero Creek in nearby Goleta, which is tidal below its check dam. But above the dam, its fresh water section supports a jungle of willows, cottonwoods, a few small live oaks, and the first Big-leafed Maple I’ve seen since coming south. I heard two singing Swainson’s Thrushes, several Wilson’s Warblers, a singing Black-headed Grosbeak with a begging juvenile. Here at the retirement place, House Finches continue to build nests on any flat surface and the Lesser Goldfinches empty my feeder in a day. But the Orange-crowned Warblers, which sang until a week ago in the park, have ceased singing, confirming that the summer doldrums will soon be upon us with few surprises in the bird world and the uninspiring sequence of daily fog and sun. Time to look to the local beaches, where shorebirds are beginning to move along the coast. Shorebirds, mostly gray or brown during the winter, are my weak link. With my Sibley open, I’m trying to bone up on leg length and color, beak differences, feeding habits. Best idea is to find a walking companion more knowledgeable than I.